The whole design is a lovely exercise in reducing a set of sound capabilities to their most essential elements. The appearance of the front panel, though, is deceptively simple. Multifunctional uses, all provided within the eight buttons at bottom and the parameter controls at top, allow effects from filtering and basic bit reduction to wild, radical bit destruction, step-sequenced filtering, delay, and even a little synthesis. 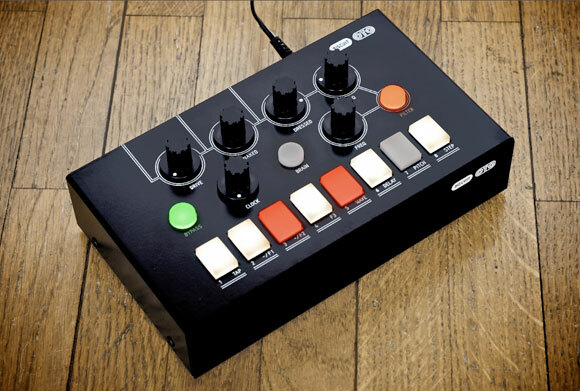 The BISCUIT is also fully MIDI-enabled: every control sends MIDI, and every function receives MIDI CC. Critical to its step-sequenced and delay functions, BISCUIT receives MIDI clock, as well, or you can use tap tempo. Finally, quality and local production figure prominently in the OTO: the company advertises that they don’t outsource production and work entirely with local companies in France. That’s pricey, I know, but it also packs as much sonic power as a collection of several Moog effects – and likewise might be the only effects box you need. And, oh yeah – the future of BISCUIT may provide more than it does now. I got to look more closely at the BISCUIT (think “bis-QWEE” as in French), at least on paper. I’ve also had the chance to talk to one of the creators about the evolution of this box, which reveals something of the process of hardware creation in general. First, let’s take a closer look at the hardware. 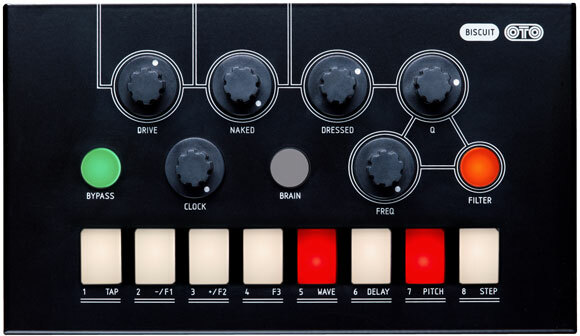 The main issue is that it’s using the 8 rectangular switches along the bottom of the unit that most directly shapes the sound, by allowing you to set each bit independently – literally, the eight bits of the signal itself. 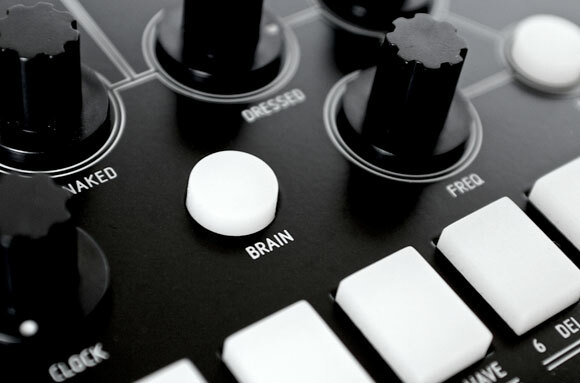 Switch off “Brain” mode, and you can directly manipulate the bits of the signal, then mix that signal with your dry source. I talked to Denis Cazajeux, creator of BISCUIT, about his work. Few years ago, I built a box in a plastic butterdish, to simulate the sound of an old Fairlight CMI, but without have to sample through this machine. The idea was simple: use an 8-bit AD converter with a parrallel output, and connect these 8 outputs to an 8-bit parrallel input DA converter. The sampling frequency was controlled by a special pot. You could pass sounds from a modern hardware or sofware sampler through this box to get an old-school 8-bit sampler sound. I discovered that I could get some very harsh and radical digital distortion by simply mute (always 0) or invert (a 0 becomes a 1 and the opposite) one or several of the 8 lines between AD and DA converters. 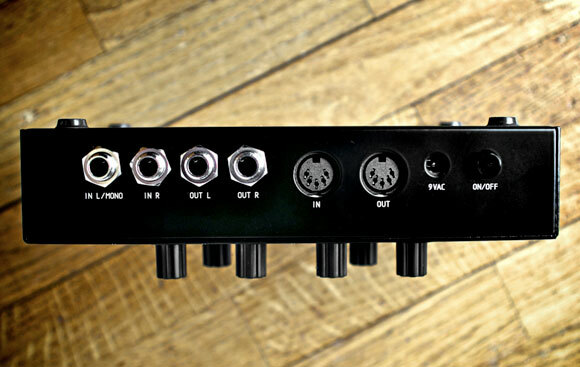 The initial box was then upgraded with 8 toggle switches, each with 3 positions (on, mute and invert). As the sound can become very strong and aggressive, I added a 12db/octave low-pass filter with a Q control. I forget a little bit this box in my kitchen for some years. One day, I met an engineer/producer in a vintage studio near Paris, where I worked as a sound engineer and maintenance tech. 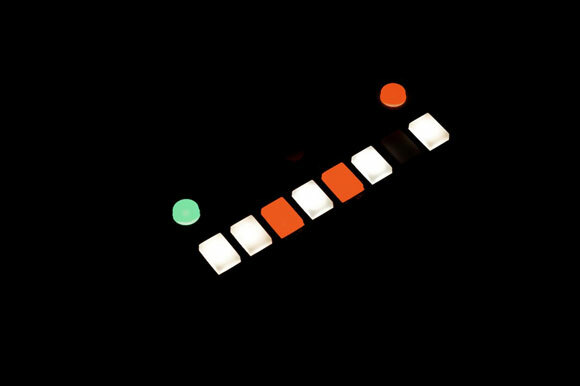 We shared the same passion for music, electronics, lo-fi, 8-bits,… (Thanks for your blog, we really love CDM and have a look on it few times a week!). There’s more than 350 components inside BISCUIT, most of them are SMD (Surface Mount Devices) to keep the product small and not too much expensive. This is small and local economy: all parts (electronics boards, metalwork, pad and knobs design, packaging…) are made in french factories (most of them are in Normandy). Each Biscuit is assembled by our hands and tested by our ears in our workshop. Input gain (Drive pot), little mixer (Naked and Dressed pots) and filter are analog, but with digital control (using Maxim digital pots IC’s), so you can memorize some presets and have a MIDI control. I choose to use hi-quality parts (Panasonic low signal relay for bypass, Polypro Caps for filter, Neutrik jacks, linear -8v/+8v power supply…). Digital processing (waveshapers, delay, pitch, bit manipulations) is pure 8-bits, using a simple Microchip PIC microcontroller. Delay and pitchshifter use the internal PIC RAM (3kB !). 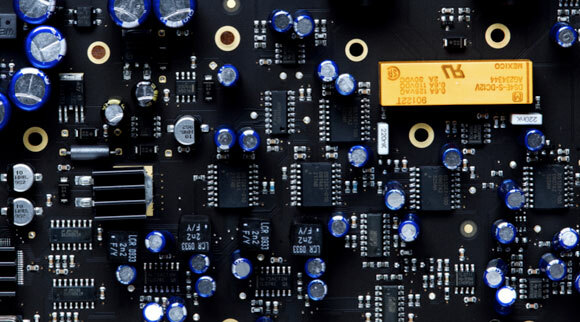 The PIC microcontroller can upgrade its firmware, using a MIDI SysEx utility (SysEx Librarian for MAC users or MIDI OX for PCs). All firmware upgrades are for free, as a simple SysEx file to download from our website. We worked with graphic artists H5 (http://www.h5.fr/). They did a very nice job for us so I wanted to talk about them! Producer/engineer Stéphane Alf Briat is the partner with Denis, and the man who prompted actually releasing BISCUIT as a product. Let us know if you have further questions for Denis. This is far more information than I usually do for a product preview, but it’s fantastic, of course, to be provided with this much detail. It looks like a fascinating design, and I can think of a couple of friends I expect will want one. More coming soon.